Korea’s answer to the Lexus at a much lower price point? Upon walking up to the G80 for the first time it was like hearing a hybrid of music in my head. Beethoven classical meets AC/DC hard rock perhaps? It’s the kind of car you can take to the some red carpet type event or just rip down the highway or winding road with the sunroof open and heavy metal blaring and in either situation you are turning heads and thoroughly enjoying the moment. The G80 has a unique look, all its own which is rather surprising in a sea of full size sedans that in some cases are suffering from identity crisis. 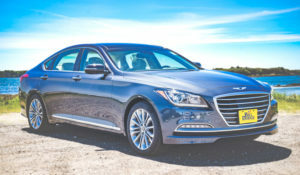 No more is it called Hyundai Genesis. It’s now Genesis much like Lexus is to Toyota or Infiniti to Nissan. The G80 has a unique front grill that doesn’t scream “I’m here, stand up and cheer” but it’s still pronounced, bold and a styling that makes the Genesis stand out but without overdoing too much it either. While having the vehicle a few days I tried to do a little bit of everything such as city driving, highway, a few winding roads, etc. In every environment it was pure driving pleasure. The car turns on a dime and is a breeze in tight spots and parking. 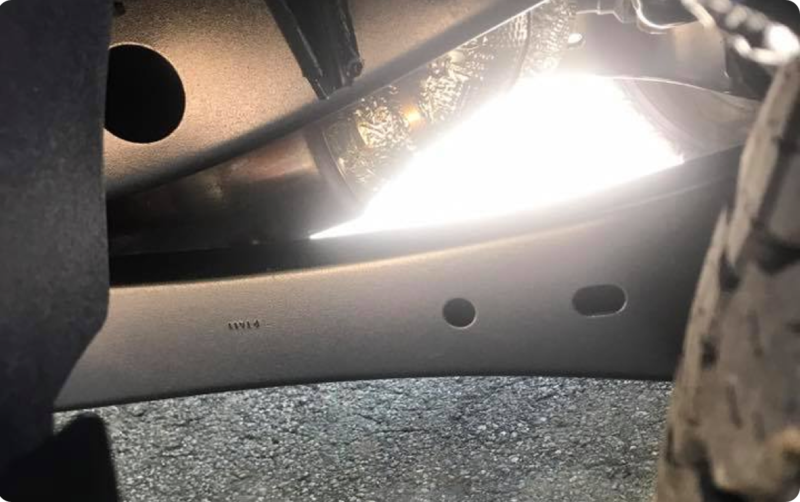 This may seem like a small thing but so many vehicles today have headrests that will certainly protect head and neck from a rear end collision but few headrests simply let you rest or support your neck against them. 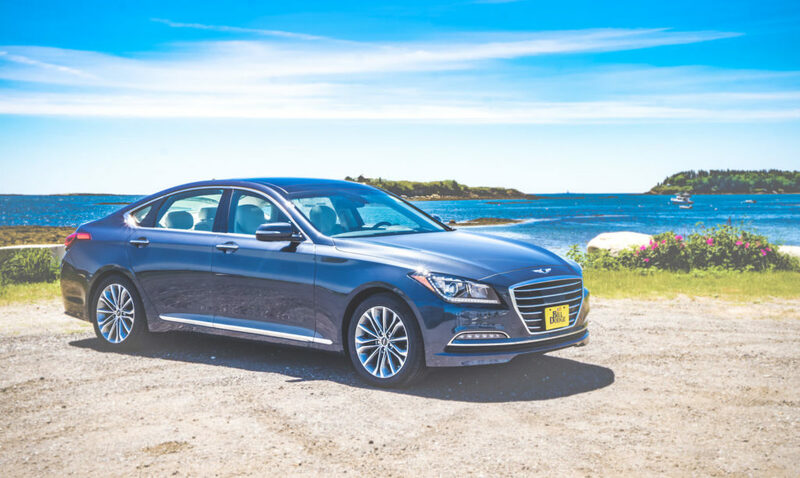 The Genesis did this adding to even more enjoyment to the ride or while just sitting and sending a text, checking emails or enjoying the 17 speaker Lexicon super premium audio. The G80 I tested had the 3.8L V-6 311HP power plant with AWD. The engine complimented the vehicle very well but if money wasn’t a factor I may opt to wait for the 2018 Sport model featuring a 365HP Twin Turbo 3.3L V-6 or just go for the the current 5.0L V-8 pumping out 420HP so I can better utilize the head rest more often when really stepping into it. In the past I haven’t always been a big fan of paddle shifters. Not sure why as I think they look very cool and give you one more way to be exhilarated but I guess I just prefer coming down on that right pedal instead. In the case of the G80 I really enjoyed the paddle shifters. On the backside of them they had rubber coating for better grip and the car just seemed to respond well when up and down shifting. I liked too how the transmission would automatically default to 8th gear or “drive” once warranted thus no need to paddle shift up in every case. The G80 has some really great touches while not over doing it and making you feel overwhelmed in terms of buttons and gadgets. The 8-speed transmission shifter feels very nice to the touch and in the right spot. Two setting memory driver’s seat was very easy to use and set up. The seats had a slight “wrap around” feel cradling you into the seat but not too much either so that you can’t move freely. The driver seat even has a recline feature that comes up under the back of your legs above the knee for a bit more support and comfort which was a first for. My 2012 Lexus RX 350 has an actual mouse for navigation of GPS and audio that allows you to rest your hand on it like a computer mouse. The G80 has a mouse of a slightly different sort. It’s a round dial surrounded by buttons to control whatever your immediate needs may be. The mouse can be moved in any direction as well as be turned. I liked too how you easily turn it to zoom in or out of the GPS screen to better see what is around you. It’s a very thoughtful design but was a little tricky to get used to given what I’m accustomed to with my point and click mouse. The GPS is also a touch screen if you prefer this over the dial. Radar adaptive cruise control too is a must for me with all future car purchases. No more adjusting the cruise control when people slow down in front of you or merge onto the highway. Radar adaptive cruise automatically slows you down as traffic speeds of the car or cars in front of you slow down. As speeds increase so will the speed of the G80 automatically. The panoramic full size moon roof was a really great touch. It makes the cabin feel bigger for those both in the front seat but especially in the rear. The G80 comes with a heated steering wheel and an especially easy to use 3 setting dual function heated & cooled seat button. 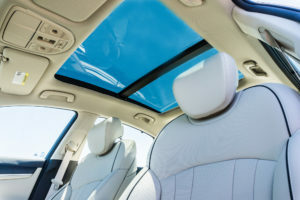 Rear seats were 3 setting heated for both passengers with a rear window power sunshade (also driver activated) and manual shades for side passenger windows. I’ve never seen textured simulated wood grain dash which is a very elegant and subtle touch. 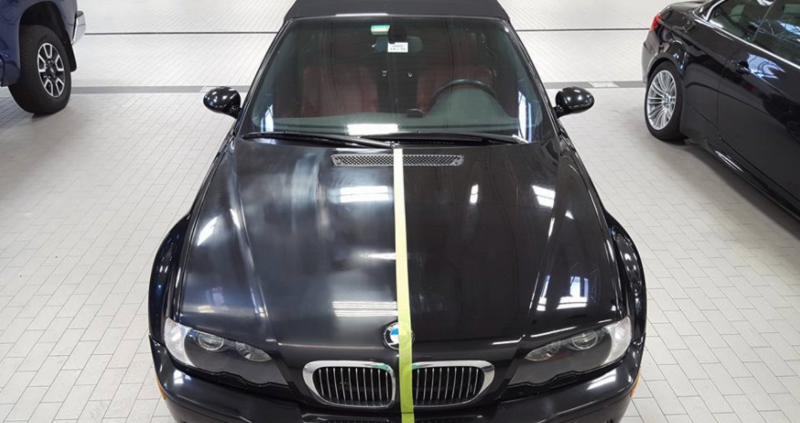 If you accidentally nick or scratch the dash it most likely won’t be that noticeable either. All interior plastics and trims were of very high quality from what I could see and looked very rich visually. A small bonus also was the rear bumper plastic applique to protect it from loading and unloading of groceries, luggage, etc. Over time this can save you a trip or two to the body shop not having to refinish the top side of bumper. The navigation screen is over 9 inches from corner to corner and really brought the cabin to life. As earlier mentioned it can be operated by both the round mouse at center console or by touch using Google and voice command. This is great for those who may prefer bypassing the mouse. The trunk is huge and even has a power button to automatically close much like with larger SUV rear fifth doors. Being someone too that cleans his cars often I was really impressed by the plastic housing enclosing the trunk brackets. Vehicles up till now have always been bare metal and sometimes a little tough to clean over time. The plastic housing not only looks rich and upscale given its smooth surface but over time will make for very easy cleaning. One thing I must mention too is the textured buttons throughout the cabin. Not simply smooth plastic but a nice rubbery texture allowing you to make just a little better finger contact within the car and cockpit. The rear seat also includes a pass through in the arm rest which is perfect for loading skis in from the trunk or other items. When visiting my friend over the weekend he immediately thought I was driving a Bentley. He said this because of the new Genesis logo on front and back with wings similar to that of the Bentley. I must agree it would be easy to deduce this despite an entry level Bentley costs 4X the cost of the G80 we tested. The two-toned alloy wheels look rich and the recessed dual exhausts integrated into the rear bumper just looks right. I must say I truly like this vehicle’s styling. Headlamps and tail lights looked contemporary, athletic and even somewhat unique this making the Genesis stand on its own even more. The day I picked up the Genesis I later went to my buddy Matt Barter’s Art Gallery party in Brunswick. Matt is a local Maine guy and slightly famous to our area. After dark around 9:30pm I walked out to the street to drive home. 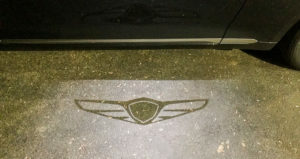 While approaching the car the Genesis logo with wings illuminated both sides of the car from beneath the side rear view mirrors (which also automatically fold in when you shut off the car). I must admit I felt a bit like Bruce Wayne / Batman getting into a much more austere version of the Batmobile. It was surprising little touches and features like these which quickly won me over to strongly consider this vehicle despite it being in such a highly competitive space. This may seem like a strange thing to mention but even buckling up was enjoyable or at least less of a task. The seat belts felt light and silky smooth taking very little out of my right arm unlike with some vehicles. The BlueLink App I didn’t get a chance to play with but I understand it is a major leap forward and can do some really cool things including starting your vehicle using your smart phone and being notified that it’s running unlike a conventional key fob remote starter which requires in most cases making visual contact with the car while turning it on and off. The app can control vehicle temperature and a host of other features too including the health of the Genesis and any needed maintenance. 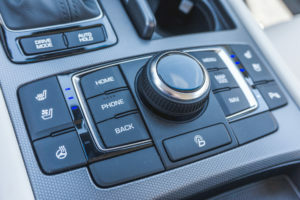 BlueLink is also able to connect with Google allowing you to speak and choose a destination into the GPS hands free. I love this feature! Lane Assist is really great too as it helps you to stay in center of your lane along with sensors and warnings if you get too close to another vehicle. Something too that I really was impressed by was the heads up display. Not only did it show my speed and the actual speed limit for any road I was traveling but also included navigational turns coming up and occasional radio channel changes. It really helped me stay focused with “eyes up”. This is just one more safety feature to help ensure good sense driving. The steering wheel had a scroll wheel feature allowing you to quickly go up or down with volume as well as a preset toggle for your favorite channels whether it be AM-FM or Satellite Sirius Radio. Pros: Super premium Luxury without the super premium price tag. The G80 AWD we tested included “Ultimate Package” which was $5k additional putting you at an MSRP of $54k and change. Cons: Body side moldings would help with door dings. I’m sure its an available add on from dealership. In some cases however the absence of moldings look better and perhaps Genesis already took this into consideration. Touch or tap sensitive door handles to unlock the vehicle using Bluetooth would nice as is the case with the G90. The G80 requires you to press the button on door handles which will unlock vehicle. Touch or tap sensitive door handles to unlock the vehicle would be nice as is the case with the G90. The G80 requires you to press the button on the door handles which will unlock the vehicle. 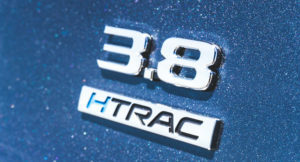 If you are looking for a vehicle that turns heads, superb build quality and super premium luxury this vehicle should be in your top 3 short list. Price wise it’s a tough act to follow especially given that it’s AWD as well and decent mpg’s of 25 highway. A two wheel drive version is available for a bit less money. 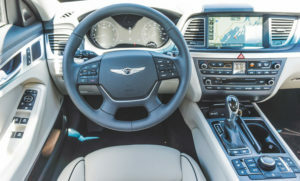 The G80 allows the driver and passengers true comfort and refinement while simply being parked, doing a slow crawl through the city or a much faster pace on the open rode. Do yourself a favor and at least take one for spin prior to parting with $60-$85k on something else.